- Keep going up the pyramid until you fail or stop at level 10, and then repeat in reverse order. Many people ask if you should repeat the 10th set again or do it only once. The math works like this: if you do a 1-10-1 pyramid, the repetitions equal 100 repetitions. If you are doubling and tripling the pushups and abdominal exercises, then you will have 200 and 300 repetitions by completing the pyramid. So, it is up to you if you want to do an Egyptian Pyramid (1-10-1), or an Aztec Pyramid (1-10-10-1 repeating the top set again). 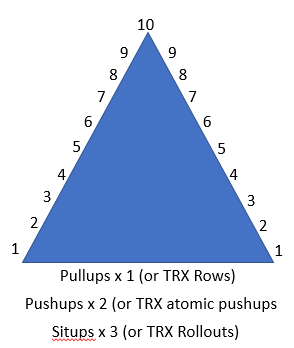 * Note -- you may want to adjust the exercise options on the pushups and sit-ups, as doing a full pyramid equals 200 pushups and 300 sit-ups (or TRX pushups / Rollouts). You may want to limit the number of TRX rollouts to less than a total of 50 if you are new to this exercise, and select other abdominal exercises of choice throughout the pyramid. Another option for abs of choice is to do the plank pose for the appropriate number of seconds -- so 30 reps of abs of choice could be replaced with 30 seconds of plank pose. Pullups - Replacing pullups or TRX rows may not be the more difficult option, however, when you fail at pullups, you can do the remaining repetitions of each set with the TRX row to complete the pyramid workout. Also, if you cannot do ANY pullups, the TRX row is an excellent replacement to the pullup. TRX Atomic Pushups – With your feet in the straps about 12 inches off of the floor, get into an elevated pushup position. Do a knee up followed by a pushup and repeat. These are tough and some sets you may want to go back to the normal pushup. Maybe try the TRX on the odd set and the regular pushup on the even sets when you first try this variation. TRX rollouts – With your forearms in the straps below the elbow, get into the plank pose with the straps in a vertical position. Use your hips and core to get back to the standing position. Repeat for the repetitions required. Once again, do not do all sets with the TRX rollout in place of sit-ups or crunches. Enjoy the progression. The TRX or a weight vest will add significantly to the difficulty to the PT Pyramid if you need it.